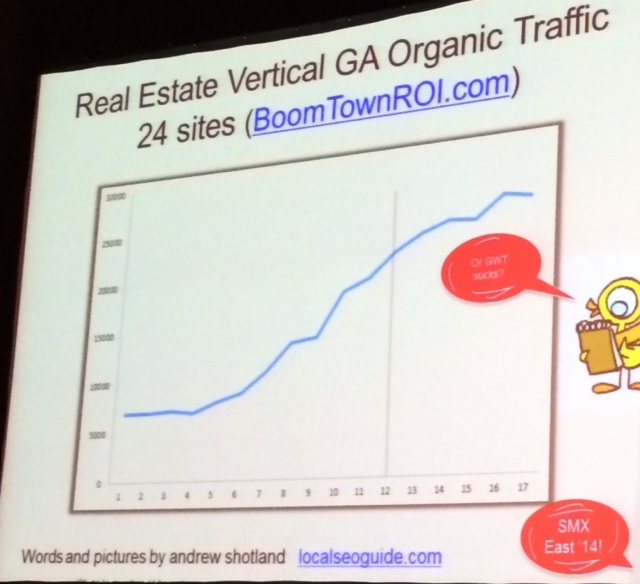 In July, the quality of Google local search results took a turn for the worse, experts say. The cause? A pesky little creature called the Pigeon Update crawled into the maps, local packs and authoritative one boxes. Learn what changed for searches with generic terms, geolocally modified terms, and see some of the wacky-broken results that have cropped up since Pigeon landed. 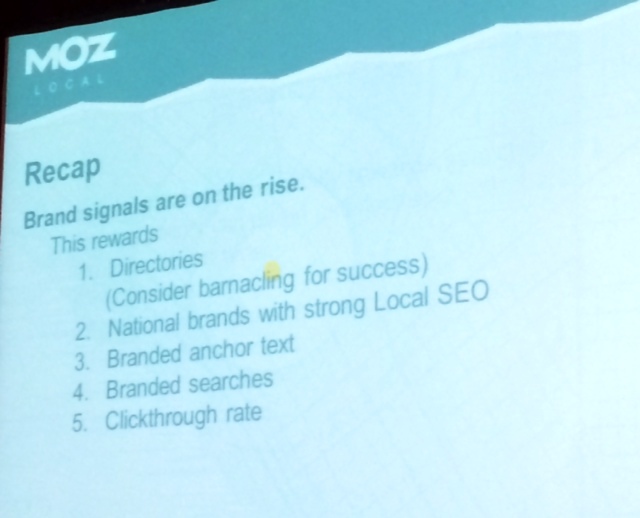 Let’s look at how these 3 things hold up to the results of his analysis of search results according to Moz data. The query “day spa san francisco” shows a very similar set of results in local Google Maps and web rankings. This looks like supporting evidence for what Google said. Knowledge Graph: it’s clear there was an update. There are now some strange results like an answer box for a query where it doesn’t really make sense (e.g., “DWI attorney new Orleans” is not a query that should get an answer box). Google is definitely ratcheting up the KG signals, but it isn’t getting it right yet. Andrew Shotland’s article “Is your local business ready for Google’s neighborhood algorithm?” shows good evidence of the truth of No. 3. Searching for “convenience store,” a general term, gives you a tight radius of results to your location. By adding a geomodifier, results open to a larger radius. This is true for carousel results as well. Dr. Pete is the Moz mad scientist. He pulled some data that showed a 23% drop in total results showing local packs. There was a fairly even breakdown of gains and losses. Losses were often on real-estate related terms while branded terms saw gains in packs and one boxes. Takeaway: If you’re a brand with physical locations in a given market, if you can make your physical locations clear to Google you’re likely to get authoritative one box or in the packs. Here’s an example of a generic term that gained local authoritative one boxes: “boats for sale” search in Connecticut gives an authoritative one box to Jack Regan’s Yacht Shop. The best guess as to why is Google is using a signal from Acxiom, a known data aggregator Google uses for local data. Every year David Mihm surveys the local search industry experts about local search ranking factors (LSRF) that are gaining and losing importance. Here are the generally agreed upon winners and losers this year. He sees Pigeon as an amplification of Hummingbird — that is, a strong brand preference. Web signals like links have never been good at identifying worthy local businesses. 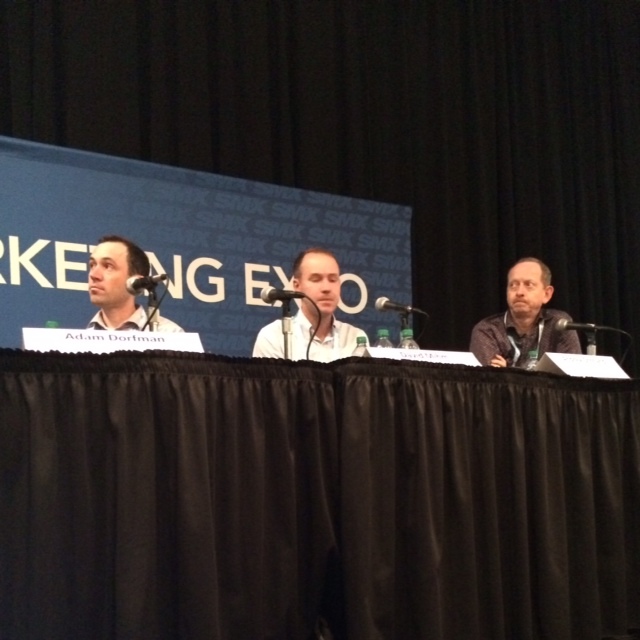 Directories’ internal links are more powerful than all but a handful of inbound links. What about pack results? Spammers who know Google’s playbook are the ones winning. 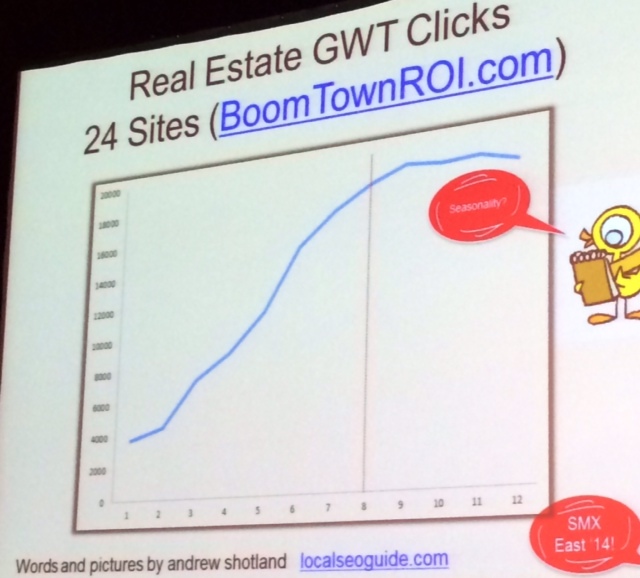 Andrew Shotland does local SEO for both big sites and little local ones. 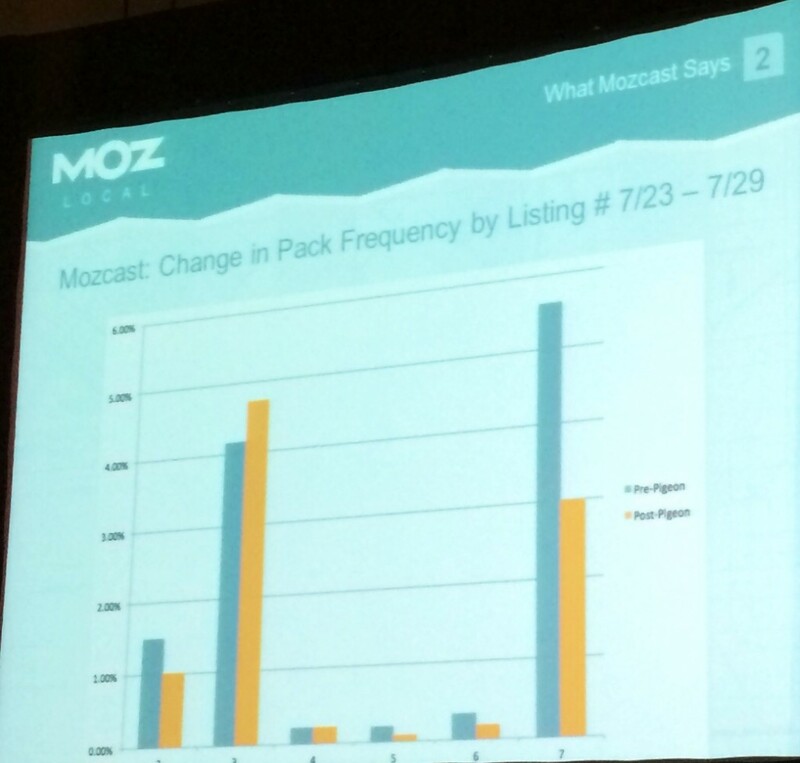 In May, local pack results disappeared for a lot of real estate-related queries. That seemed freaky, and not good for his real estate clients. Over 30 days they pulled this data for 24 real estate clients. They saw the same pattern for roofing clients and moving company clients. Traffic was going up even though local pack results had disappeared. 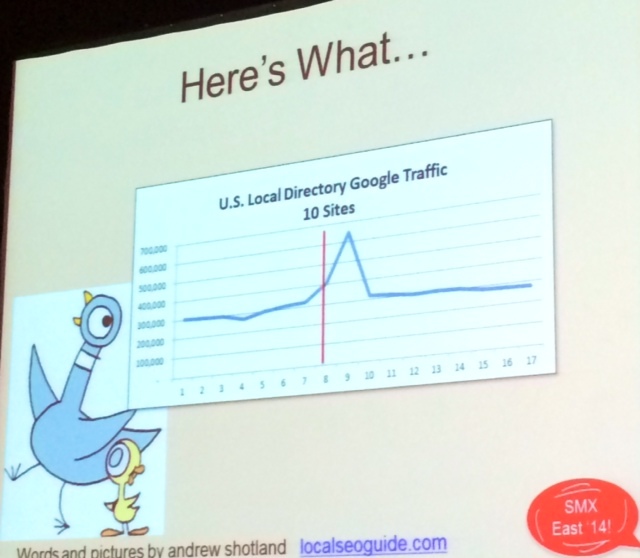 Pigeon was awesome for sites that lost head terms and were getting long-tail traffic. Seemed to be seasonality at play. Impressions jacked up after Pigeon. Traffic started to drop as impressions started to drop. Their conclusion from the data is that nothing really changed in terms of performance for roofing and moving company clients. 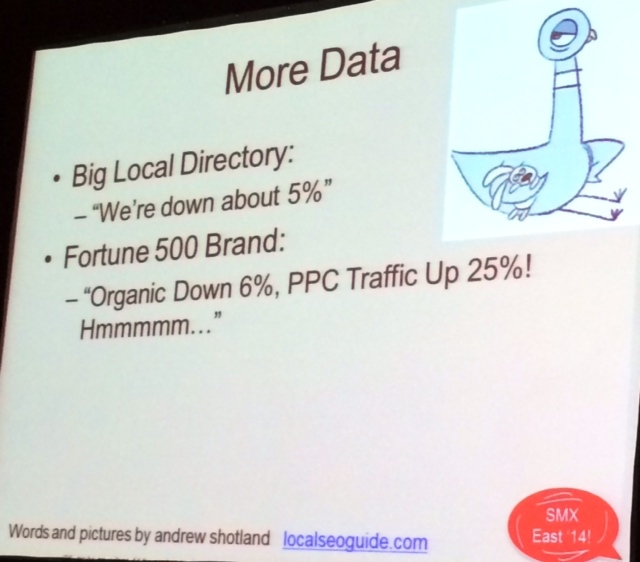 If you lose pack results, directories will naturally rise up; that probably happened for stronger directories like Yelp and Trip Advisor, but it turned out that for most smaller directories, the rankings hadn’t gone up, and some lost traffic post-Pigeon. 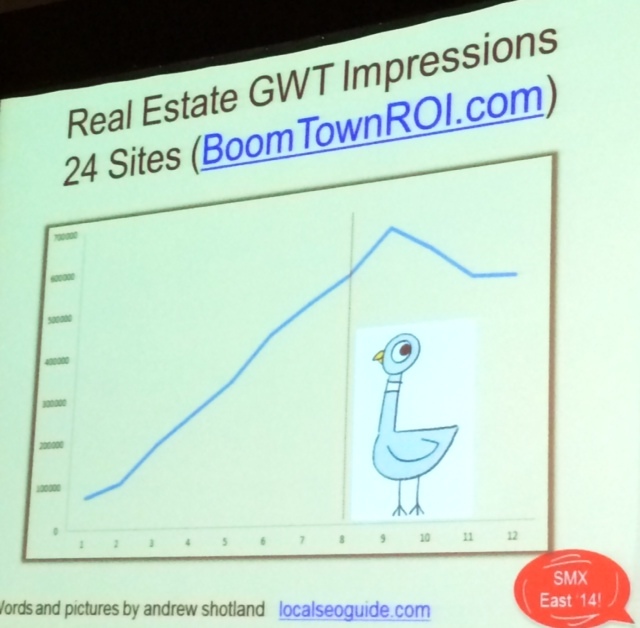 For most directories they work with and those they’ve talked to, Pigeon was +/- 5%. And a notable difference after Pigeon is that there’s plenty of spam! He himself made some fake listings to test with fake addresses and exact match domains set up with a Yext power listing; those fake results got up in pack rankings in about 3 days. There are cases where Google’s backend data set is broken, and the only fix is to wait for Google to figure out what’s broken and fix it. Adam Dorfman’s presentation is available at: http://bit.do/pigeon. He likes to take Matt Cutts and Google at their word to believe that any changes by Google are meant to improve quality of search results. So, he doesn’t worry as much about a change to quantity of traffic, but rather looks to see indications of improvement in quality of traffic; that is, if (on-page) conversion rate goes up. What difference makers to measure? 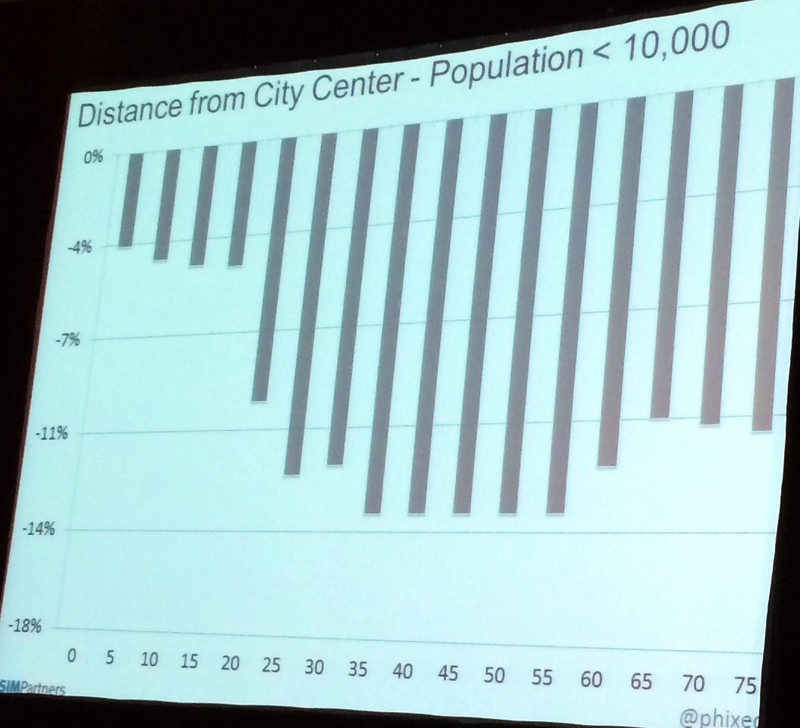 Note the drop-off of performance when businesses in small cities were more than 15 miles from city center. 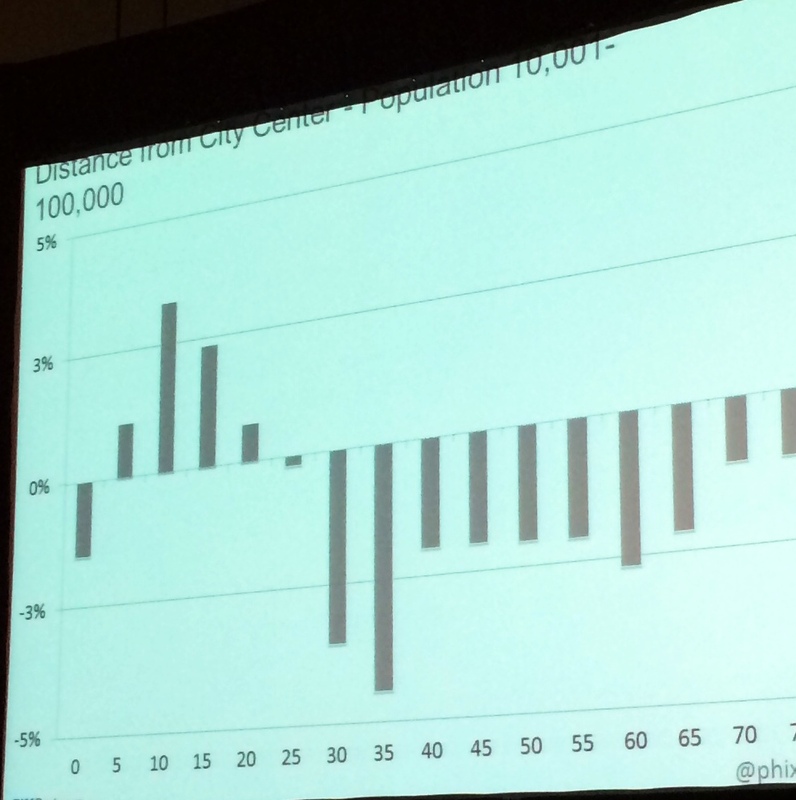 Note the drop-off of performance when businesses in mid-sized metros were more than 20 miles from city center. If you’re a new business and you have no links, you really need a few links to get into the game. Page authority matters. External factors are increasing in importance. ZIP code served and area served are two things local clients often have on site. They that found having multiple ZIP codes, up to 3, helped conversions. 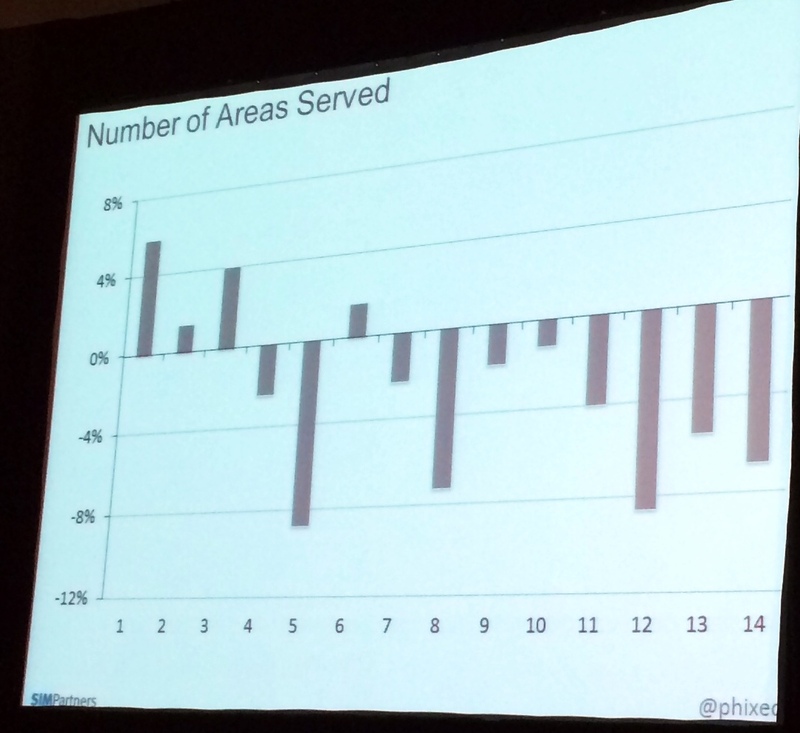 Likewise, listing more areas served was a big boost to performance. 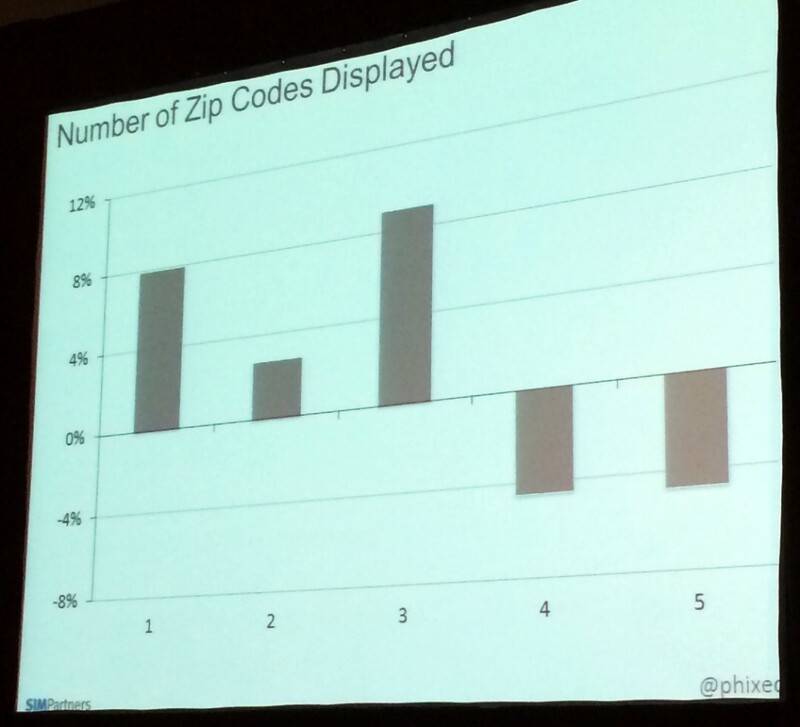 Conversions occurred when businesses listed one, two or three ZIP codes and dropped off when four or more ZIP codes were listed. On-page optimization still matters. Over-optimization is being targeted. Keep experimenting. Pigeon Update doesn’t equal improved SERPs. Where your business is still matters. Attach your business to strong domains where possible. This is called “barnacling,” attaching yourself to strong domains. And don’t over-optimize your location pages. Experiment with what you’re doing on your website and location pages.